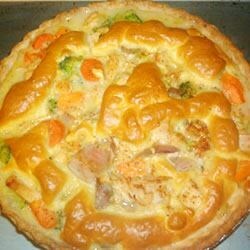 "Quick and easy chicken pot pie dish with cheese and broccoli." Steam carrots and broccoli in a covered pot for 3 minutes, until slightly tender but still firm. In a large bowl, mix together carrots, broccoli, chicken, soup, milk, cheese, and salt. Spoon mixture into pastry-lined 9 inch pie pan and cover with top crust. Seal edges and cut steam vents in top. Bake in preheated oven for 30 minutes, until golden brown. All I have to say is, it tasted like cream of chicken soup. I don't consider this cooking, and I wish I could find a better pot pie recipe on this site. I used this pie crust: http://pie.allrecipes.com/az/BestEverPieCrust.asp?lnkid=563 and it was excellent. I highly recommend it. A real family favorite! To cut time, I used the mixed veggies in a bag. Super quick & easy!